Finally made it to Minneapolis! Yay! I was really excited. I have to give a major thank you to Stephanie and Bob from Above The Falls Sports! They allowed me to store my canoe and gear at the shop so I could run around Minneapolis and explore. You guys remember Tom from earlier in my trip? It was his birthday so he invited me over for a BBQ. His daughter Tessa worked at Above The Falls Sports and she drove me to their house. I had a great time! Tom’s friends and family are wonderful. The next day we ate a great breakfast and then Tom took me to Gander Mountain to get a new tent. I scored a nice tent for a great price. I’m very pleased about that! Tom took me back to Above The Falls Sports and the owner Bob was there. I was happy to meet him and give thanks personally. He also let me and Tom take a couple of their brand new trikes for a ride around the city. That was a lot of fun!! My legs sure felt it afterwards. I still managed to walk across the Stone Arch Bridge and see the falls. I got a hotel room for the night and then Patrick picked me up and we went out to a bar for a few drinks. We had fun and it was great to hang with Patrick again. At some point I lost my phone so the next morning consisted of replacing it. All of my great pics from the city are gone now. I’m really bummed about that! I got a late start getting back on the river. It was a little after 6pm before I launched. I figured that was just enough time to get through lock and dam 1. I was wrong. The headwinds slowed me down to a crawl and I arrived at the lock just after 8 pm and it was closed. The shoreline was mostly steep except for one spot with a mattress on the beach. It had to do because a big storm was on the way. To add to the excitement, Scott sends a link warning of catastrophic flooding near Aitkin, MN. I was a little worried it would cause the river level down here to rise as well. That would be a problem because of my camping location. Turns out it won’t rise until later in the week! Whew! 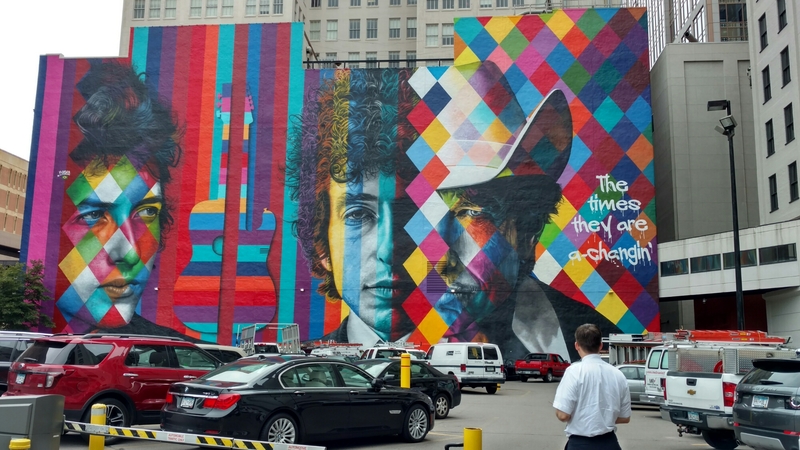 A Bob Dylan mural. He’s from Minnesota.